Dr Bonnie Wolff-Boenisch leads the Research Affairs of Science Europe, a Brussels-based organisation, representing at present 43 Research Funding Organisations and Research Institutes from 27 countries. 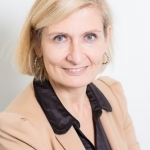 She provides strategic leadership to the Scientific Advisory Committee who provide scientifically independent advice to Science Europe on key European research policy topics and on the implications of EU legislative and regulatory developments. Dr Wolff Boenisch gained substantial insight in science management and science policy as co-ordinator of an ESFRI research infrastructure initiative in polar and marine research linked to the climate change debate. Previously, she was project manager of several international scientific and technologically-oriented consortia where she was responsible for the development and oversight of decision making structures and multi-national collaborations.